Illustration courtesy of River Rock Designs, Inc.
River Rock Designs is located in Austin, Texas and can be found online at http://riverrockledlights.com The River Rock All-In-One headlamp (#RHFC3A) is powered by three AAA batteries. It offers 125 lumen output and 10 hour run time. River Rock also offers a less expensive two AAA battery headlamp (#RH052A), which has an output of 26 lumens and a two hour run time. Due to its longer run time, the All-In-One model reviewed here will be the choice of most sportsmen, campers, amateur astronomers and others who are likely to spend an extended time outdoors at night. The RHFC3A has several good features. The bright white LED focuses from well defined spot to flood settings by means of a convenient little orange lever at the top front of the light. There are two orange "on" push button switches on top of the light. The right hand button turns on the bright white LED; a second push makes the light blink; a third push turns the light off. Press and hold the white light button and the light dims, allowing from 100% to 10% output. The left hand push button turns on the colored LED's, of which there are one blue, one green and two red arrayed below the reflector of the main white LED. Pushing the left button turns on, sequentially, the blue LED, the green LED and the red LED's. Depress and hold the switch during red light operation to initiate a flashing SOS signal. Green is intended for map reading, blue for tracking and red to preserve night vision. The light housing is hinged at the bottom so that it may be angled down for reading or other close work. The three AAA batteries are inside the main light housing (no separate battery pack) and the battery cover is O-ring sealed to keep out rain. Naturally, the elastic head band is adjustable for length and there is a forehead pad for comfort. Like most (but not all) of the LED lights we have reviewed, the River Rock lights are made in Red China. This is clearly a well thought out head light. Its features are convenient to use and it works as advertised. It is fairly large for a headlamp, weighing 3.4 ounces with batteries, but comfortable to wear. The band and case are damage resistant black polycarbonate, with orange on/off buttons and focusing ring. A trio of Duracell alkaline batteries is included with the River Rock headlight, so it is ready to go out of the box. The white 125 lumen LED is a Cree Q4. The colored LED's have a 1.8 lumen maximum brightness. Three inexpensive and commonly available AAA alkaline batteries will run the white light at maximum output for four hours and the battery life is 10 hours at maximum brightness or 20 hours at 50% brightness. The flashing setting is good for 30 hours. The single green and blue LED's will run for 100 hours, while the dual red LED's are good for 50 hours. The red SOS flasher will run for 100 hours. To change batteries, merely depress the black plastic release at the top center of the light and the battery compartment hinges open. Press the case together firmly to close. The LED's will burn for over 10,000 hours and never need replacement. River Rock Designs backs their lights with a lifetime warranty against manufacturing and design defects. Dimensions: 2.5" x 2" x 1.7"
The River Rock All-In-One worked exactly as advertised. Its white LED is very bright at full power and the circular coverage pattern is well defined. The spot/flood lever is continuous, allowing the wearer to set the light coverage anywhere between the extremes. The dimming feature is handy and prolongs battery life, but I dislike multiple function push buttons. A separate bright/dim lever, similar to the spot/flood lever, would be more convenient. However, this is a minor complaint. The white and colored LED's work independently. They cannot be switched on simultaneously. Pressing the colored light button with the white LED on switches off the white LED as it turns on a colored light and vice-versa. The white LED always turns on in the high (maximum brightness) setting. Why there are two red LED's, I could not say. Night vision is best preserved by a dim red light and running two red LED's halves the battery life. There is no easy way to access the circuitry inside the light to short around one of the red LED's, so that is not an option. Amateur astronomers and others for whom preserving dark adaptation is paramount will probably want to cover the red LED's with a couple layers of automotive tail light tape, or something similar, to reduce the brightness. I wish that River Rock had specified a dimmer function for the colored lights, or at least the red LED's. However, even running two red LED's, the 50 hour battery life should get most astronomers through several observing sessions. Although this headlight is intended primarily for hunters, fishermen, campers and other outdoorsmen, it is a versatile light with many possible applications. For example, it would be handy during an urban power outage. It would also make an excellent night reading light for the traveler who does not wish to disturb his or her stateroom companion, as well as a viable emergency light. It would be a handy item to carry in your boat or vehicle, making solo minor repairs or changing a tire at night a lot easier. In fact, a hands free, versatile lighting system like the All-In-One has dozens of uses. A headlamp is the most convenient sort of night light for the amateur astronomer. The All-In-One's tilting feature allows the wearer to put the light exactly where needed and leaves both hands free. 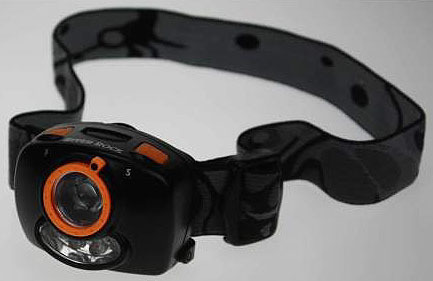 The River Rock All-In-One headlamp works well, is comfortable to wear, easy to use and affordable. You can buy yours from your local dealer or direct from River Rock online. I'm keeping the sample reviewed here!